The 1st was the Day of the Dead. Today is National Deviled Egg Day Tomorrow is National Sandwich Day. The 14th is National Spicy Guacamole Day.The 23rd is National Cashew Day. The 29th National Chocolate Day. Veterans Day occurs on the 11th each year. It is for honoring those who have served honorably in the military during both wartime and peacetime. November is Good Nutrition Month, National Pomegranate Month and National Raisin Bread Month. Also National Pepper Month.And let’s not forget Mr. Turkey!!! Thanksgiving will occur on the fourth Thursday this month. August is Family Meal Month. National Sandwich Month, and National Peach Month.Also National Catfish Month and National Panini Month. National Watermelon Day is the third. National Zucchini Day is the 8th. National S’mores Day is the 10th.Potato Day is the 19th. And National Cherry Popsicle Day the 26th. National Trail Mix Day is the 31st. Julia Child’s Birthday is the 15th. 1912. Just a few. Many more, but too much too list. If you have a Birthday this month, Happy Birthday to you. Everyone have a Wonderful Day! Celebrate National egg month in May by brushing up on the history and health benefits of this incredible edible. BREAK THE FAST: During medieval times, eggs, milk and meat were forbidden during Lent. They were traditionally used to break the fast on Easter Sunday. GOOD FOR YOU: Research has shown that one egg a day won’t increase the risk of heart disease in healthy adults. Plus, eggs have vitamins B12 and D, Riboflavin and Folate. DYE DESIGN: Red is the most traditional color for dyeing Easter eggs, and it remains the most common color used today, especially in countries with Orthodox faiths. ON A ROLL: The first White House Egg Roll took place in 1878 with President Hayes and his wife, Lucy. Today’s youngsters gather on the south lawn the Monday after Easter for this traditional event, which is open to the public. A NO-FAIL METHOD FOR HARD-BOILED EGGS: Place eggs in a single layer in a large saucepan. Add cold water to cover the eggs by 1 inch. Bring to a rapid boil over high heat. Remove from heat, cover and let stand for 15 minutes. For extra large eggs, let stand for 18 minutes. Drain, then place in a bowl with ice and water. When completely cooled,drain. To peel, gently tap eggs on the countertop and roll between the palms of your hands. Information from: Publix Family Style Magazine. Here we are in November already.There will be a lot of Holiday Talk and Shop Talk from now until the end of the year. Holiday gifts, decorations, and food. So stay tuned in for all of the Great Holiday Recipes and Ideas. The 1st was the Day of the Dead.Yesterday was National Sandwich Day. The 23rd is National Cashew Day. The 29th National Chocolate Day. Veterans Day occurs on the 11 each year. It is for honoring those who have served honorably in the military during both wartime and peacetime. November is Good Nutrition Month, National Pomegranate Month and National Raisin Bread Month. And let’s not forget Mr. Turkey!!! Thanksgiving will occur on the fourth Thursday this month. August is Family Meal Month. National Sandwich Month, and National Peach Month.Also National Catfish Month and National Panini Month. National Watermelon Day is the third. The 6th Root Beer Float Day.National Zucchini Day is the 8th. National S’mores Day is the 10th.Potato Day is the 19th. Spumoni Day is the 21st. And National Cherry Popsicle Day the 26th. Banana Lovers Day is the 27th. National Trail Mix Day is the 31st. Julia Child’s Birthday is the 15th. 1912. Friendship Day is celebrated on the first Sunday in August. August is also National Eat Dessert First Month. Good Morning Readers. Today I want to share a Wonderful Recipe. 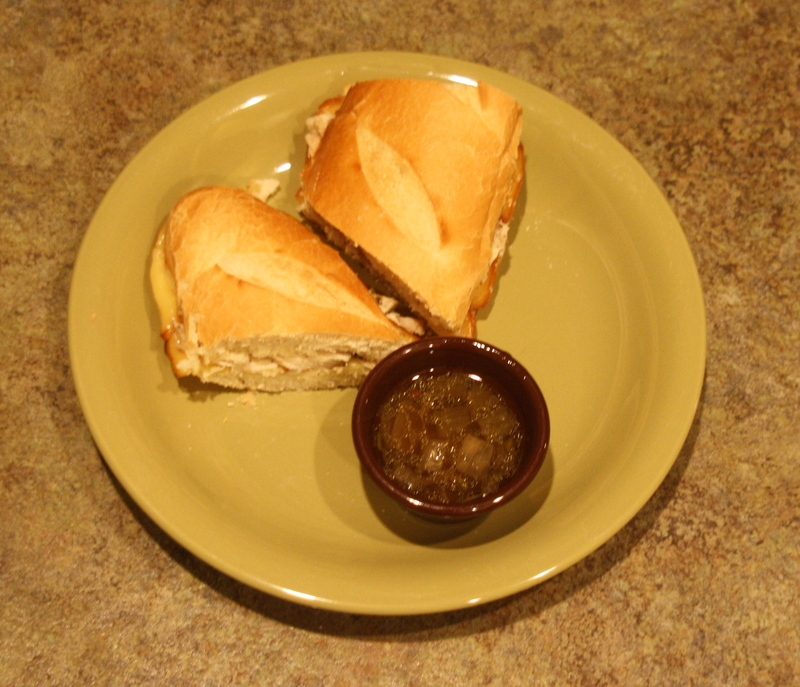 Turkey Roast Dip with Melted Gruyere. The recipe came from Kelsey Nixon from Kelsey’s Essentials. The only thing I did different was she made it in a slow cooker. I do not own one, so I slow roasted it in the oven. OMG! It was Great! Here is the recipe. In a small bowl mix: 1/2 stick softened butter, 1 Tbsp. fresh thyme. 1 Tbsp. fresh parsley and S/P. I used a large rectangle baking dish. 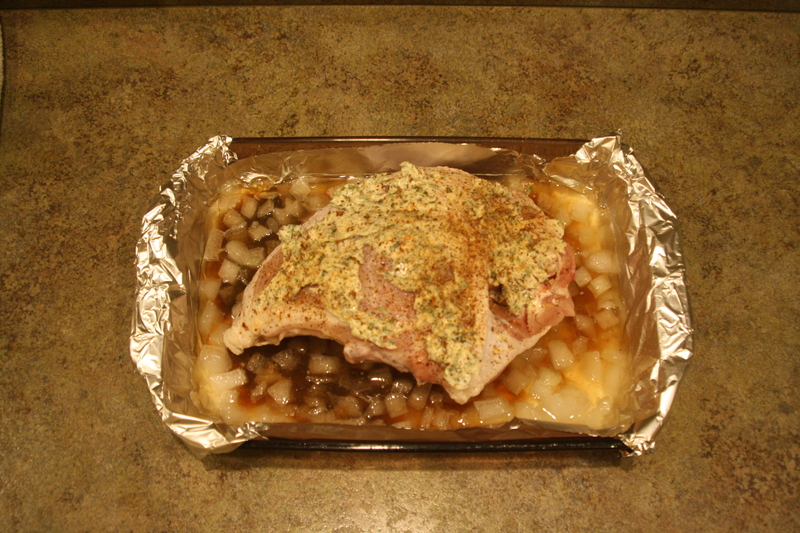 Lined with foil and sprayed for easy clean up.You will be using a Turkey Breast bone in skin on. Pat dry very well. Rub this butter mixture all over it and under the skin. To the baking dish add 1 chopped medium yellow onion, 1 cup chicken stock, 1/4 cup worchestershire sauce. On top of that place the turkey skin side up. Cover tightly with foil. 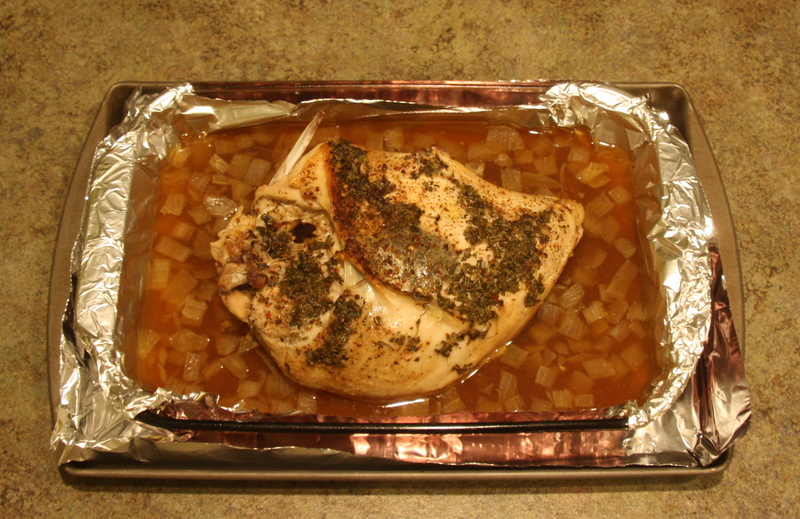 I lined a cookie sheet with foil and placed under the baking dish to catch any drips that may happen while roasting. Didn’t want my oven to get dirty. Bake 325 for 1 1/2-2 hours until 170 degrees. Let rest 10 minutes before slicing. French Bagette, slice long ways, brush both sides with softened butter. Add sliced Gruyere to one side. Broil until toasted and melted. Place sliced turkey on sandwich. Have the juices- sauce on the side. Kelsey Nixon said it was like a french onion soup on the side and she was right. It was Wonderful! Dip the sandwich in and Eat. I have made a lot of whole birds for Thanksgiving but never has the Beast meat turned out this moist and tender. This was sooo GOOD! Last year I made a whole bird and all the trimmings. But this year I think I am going this way. I am going to make a couple breasts this way and maybe try a couple of turkey legs also, place them on the platter whole with all of the holiday sides to go along with. The Turkey breast before it’s sliced is beautiful enough to serve to guests on Thanksgiving. The butter melts into the meat but those fresh herbs stay on top and it looks lovely. And I can’t say enough about how tender and moist it was. No basting was required at all. With the foil over the top it did all of that on it’s own.Then the days after I can have the Roast Dip Sandwiches. The Gruyere Cheese is a must. It has a nice smokey flavor that goes very well with the turkey. Wednesday I will get it all ready. Thursday morning I can let it rest on the counter for about 30 minutes before the slow roast begins. And while the Parade is on in the morning, it can slow roast to a wonderful perfection! And fill the house with the Thanksgiving Aroma that I love. 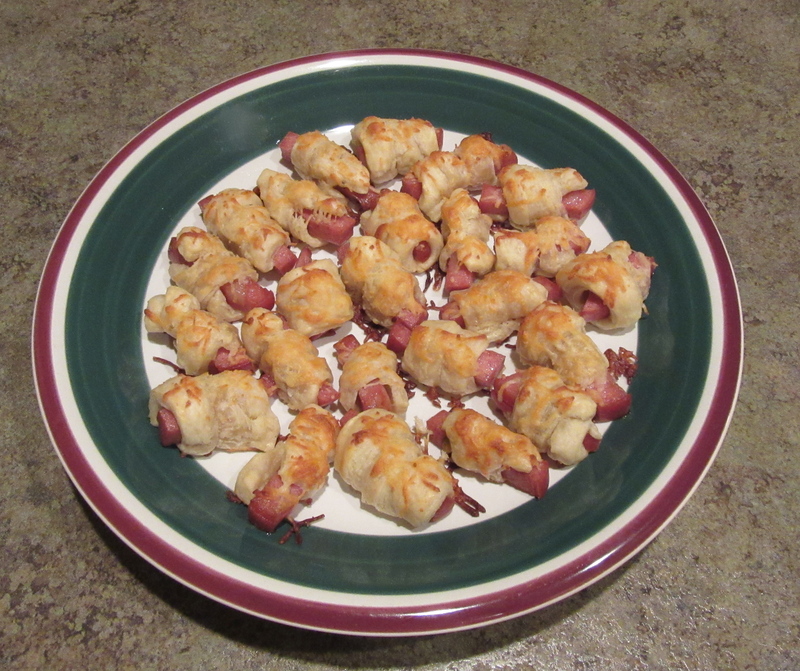 Thank you Kelsey for a Great recipe. I will be making this again and again.